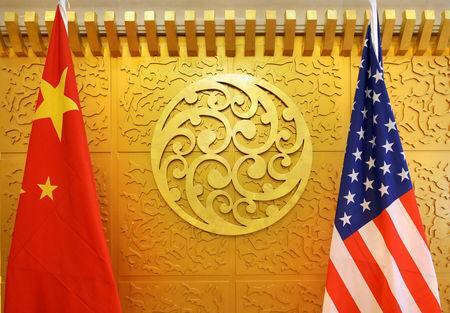 BEIJING (Reuters) - China said on Friday it had lodged "stern representations" with the United States after the U.S. Navy sailed a ship through the contested South China Sea, passing near islands claimed by China. Tension between the two powers in disputed Asian waters comes as their relationship has between strained by a row over trade involving increasingly severe rounds of tariffs on billions of dollars worth of each other's imports. The U.S. guided-missile cruiser USS Chancellorsville sailed near the Paracel Islands on Monday to challenge China's "excessive maritime claims", the U.S. Pacific fleet said in a statement. China foreign ministry spokesman, Geng Shuang, told a daily news briefing the U.S. ship had entered Chinese waters without permission and China had made its position known with its "stern representations". The Chancellorsville's voyage was the latest in what the United States calls freedom of navigation operations aimed at challenging what it sees as Chinese activity limiting freedom of movement in the strategic waters. In particular, the United States has criticised China's construction of islands on tiny reefs and shoals and its installation of military facilities on them, including air strips and docks. China claims "irrefutable" sovereignty over most of the South China Sea and the islands in it, and accuses the United States of raising military tension with its navy presence there.